I left my family this summer. Well, just for two days. Really, it was for everyone’s good. Because this Momma was tired and needed a break pretty bad! My friend’s grandmother has a little guest house on a pond about an hour from my house, so she invited a couple of us girls to come stay out there as a little get-a-way. I wore goofy excessively tall cowboy hats and took selfies. I slept in until 9:00am! I can’t even remember the last time I did that! I sat outside for hours all by myself. I wrote a read The Word. I sat and listened for God’s voice. Cause too often I sprint through life without taking time to stop and just wait for God. I mean, I almost never just SIT for fifteen minutes and meditate and think on Him. So today, we don’t have to go on a weekend retreat, but maybe skip the dishes for 15 minutes, go outside, and just sit and meditate. Just… think on Him. I should be working on my lesson for tomorrow that I’m to teach to the middle school youth on evangelism. I should try to avoid putting in titles that are depressing and lame like the word “ugh”. I should be in bed sleeping (it’s 11:10pm). I should get up and get myself a drink of water. I should stop being overdramatic. Buuuuuuuuuuuut, I’m not. Not gonna do any shoulds right now. Cause I’m having a pity party. Why? Cause I got all freaked out that I’m not going to be able to wear the clothes that I wore last year to my husband’s trade show because I have this little muffin top when I wear the pants. 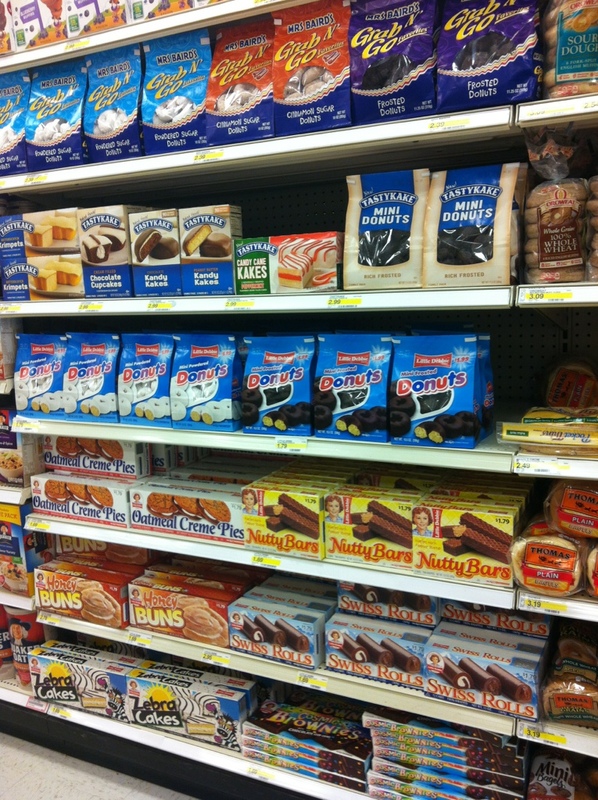 Sooooo, I went to Ross and Target looking for… I dunno. Looking for something. And well, everything looked HIDEOUS on me. And I said “You look FAT” to myself about 87 times. And then I gave back everything that I tried on at Target and went to go get a few groceries for tomorrow and I have to walk past this. I mean… seriously?!?!? I was angry that the stuff even exists! Ha – like I said… pity. party. But… well, I guess there is one silver lining here. I didn’t buy any donuts. or chocolate peanut butter cups. or ice cream. or chips. or cookies. or cakes. I said to myself, “You know those won’t fix anything” and I just moved on. Well, I took a picture of them and moved on. And before this covenant, I woulda gotten some of these AND some ice cream AND some chocolate peanut butter cups AND probably some cookie dough just in case. But God has shown me over the past year that these things do not satisfy. They do not fulfill. They do not comfort. So, to look back and “see” myself just walking away from all this stuff is a huge blessing for me. It’s actually an answered prayer. It’s evidence that God has worked in me. Of course, there had to be a but. It’s a pity party post, remember? Ya know what I found myself doing tonight? Ugh. If my husband had just let me order a t-shirt too then I wouldn’t be worried about all this. Ugh. If my husband had done the dishes for me then I’d be a lot less stressed out. Ugh. If I just knew how to play an instrument then I could vent out my frustrations. Ugh. If I had a book that I was reading then I could just pick it up right now and get lost in it. Ugh. If I had never agreed to teach tomorrow then I could just take some benadryl and go to sleep. Ya know what I found myself NOT doing tonight? Sigh. Praying and thanking God for all that He’s done this year really put me back on the right track. Sigh. Reading through Psalms just now made me feel so much more appreciative. Sigh. Meditating on what God is: lovable, compassionate, kind, patient, powerful, faithful… really refreshed my spirit. But, in the meantime, I think I’m going to lay down, close my eyes, and at least do one of those “sighs” from above and mediate on what God is. One of the things that has been the best for me as I go down this journey is this blog. Sure, I fall behind three or four days when life gets crazy (like, this week, when ev.ery.one. in my family, including me, got sick) but being able to come back and refocus my attentions to God has been… well, a God-send! Even though I read the bible every day sometimes it’s not necessarily a direct connection to my covenant. Sometimes I need to remind myself of how the Word applies to my covenant specifically. And that is how this blog has helped. But as I talk to more and more of you that are signing up with God to do a covenant of some type, I have realized how a lot of people… for a slew of different reasons… don’t really have thirty minutes to journal or blog or meditate or whatever every day. 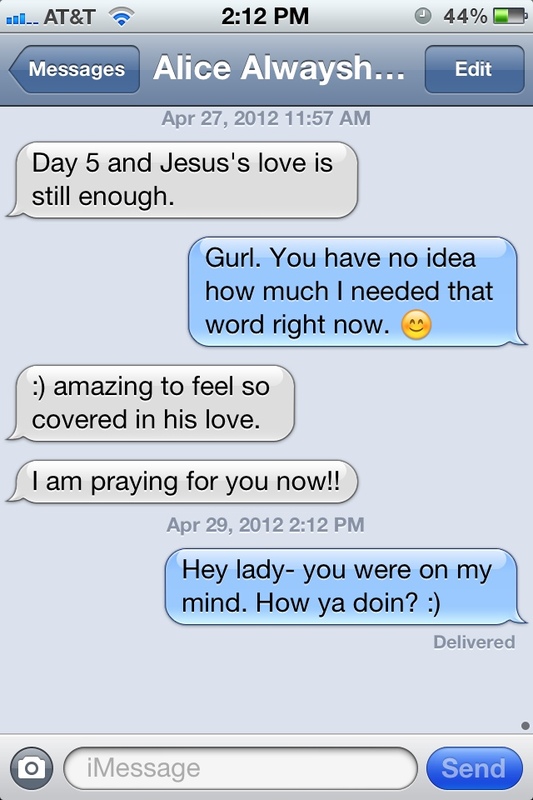 And her little statement of “Day 5 and Jesus’ love is still enough” sort of made me think. Wow. Just taking thirty seconds every day to write down either how Jesus has worked in your life or a scripture that helped you or a prayer. It could be such a neat way to see what God is doing for you. Or a way to find that verse again really quickly that ministered to you when you wanted to break. You could get a little week at a glance calendar (my grandmother used to do this) and write in it every day at lunch or at bed or something. Or I’m suuuuuuure there is an app out there for this. Or start a private twitter account that isn’t public. But I would say that being able to write down every day at least one sentence about the renewal that God has given you… well, it could be the thing you need to keep you going. I mean I’m not saying write your sentence in sharpie on your forehead every morning- haha- but it’s the same concept. We need a daily reminder of God. a daily reminder of how far He has brought us. a daily reminder of His Goodness. His healing. His power. So, there ya go. A suggestion to you and me: take it one day at a time. And as for me too, Alice, day 109 and Jesus’ live is still enough!